Losing biodiversity or naturally variable? 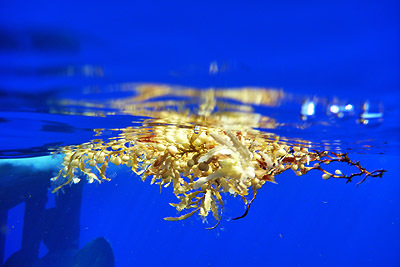 Sargassum macroalgal rafts in the Sargasso Sea are vital feeding and spawning grounds for pelagic fishes, seabirds, sea turtles and whales. Many iconic animals, including endangered species and bluefin tuna, visit this habitat during their open-ocean migrations. Sargassum rafts are considered ‘essential fish habitat’ by the South Atlantic Fishery Management Council. Over 100 species of fishes, four species of sea turtle, and 145 invertebrate species use Sargassum rafts as habitat. Of these, ten species are thought to be endemic to the Sargasso Sea. Ocean acidity and summer water temperatures have increased steadily near Bermuda, at Hydrostation S, over the past three decades. Likewise across the Northwest Atlantic, the distribution and abundance of Sargassum rafts has been highly variable in recent years. How might changes in ocean conditions and Sargassum habitat impact rafting animals? In an open access paper in the journal Marine Biology we describe significant biodiversity declines and rafting community changes in the Sargasso Sea over the past 40 years (below). In 2011 and 2012 we measured the biodiversity of small fishes and invertebrates living in Sargassum rafts at four stations in the Sargasso Sea (yellow boxes in map above). We compared these measures to similar data collected from sites in the Sargasso Sea from the early 1970’s (white triangles), as well as across the Northwest Atlantic in the late 1960’s through early 1970’s (all triangles). Biodiversity of small fish and invertebrates living in Sargassum declined between the 1970’s and 2011-2012 (Fig. 1; sites marked by white triangles in map above). Rafting animal communities sampled recently were unlike any other recorded from across the Northwest Atlantic. The endemic flatworm Chatziplana grubei was not found in recent samples. These results might signal part of a long-term decline in Sargasso Sea rafting community health. The abnormal circulation patterns of Sargassum rafts in 2011 and 2012 might have led to temporary changes in rafting communities. Many marine animals are shifting their distributions northward as water temperatures rise. This does not appear to be happening with rafting fishes and invertebrates in the Sargasso Sea. Sept 23, 2014 – Over one thousand miles wide and three thousand miles long, the Sargasso Sea occupies almost two thirds of the North Atlantic Ocean. Within the sea, circling ocean currents accumulate mats of Sargassum seaweed that shelter a surprising variety of fishes, snails, crabs, and other small animals.